When you meet Lenore Lyons, you know right away that this is someone with more energy, creativity and humor to spare in a few moments than most people have in a whole lifetime. 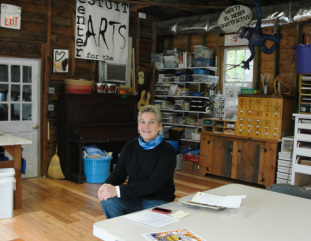 It may be the twinkling in her eyes, her quick conspiratorial smile or her eagerness to show you around the classroom and studio at the Cotuit Center for the Arts. Or it could be her excitement about the new storage areas and all the great donations that have come in, but it doesn’t take you long to know that the Center’s education barn is going to be a hopping place this winter and that Lyons, the new arts education coordinator, is going to be right in the middle stirring things up. The barn that is the studio and classroom has just had a redo, much of it done by Lyons and her merry band of elves, and is all spiffed up and ready for a busy winter season of creative fun for families and well, anyone who wants to try their hand at any number of creative pursuits. Steve Luciani of Coachlight Carpets in Centerville donated the new floor, storage cabinets were donated by the Centerville Public Library, and many other furnishings and supplies were donated by area businesses and individuals. Lyons scans Craigslist and Freecycle regularly for free supplies and is quite successful in scoring unique and unusual materials for her students. She has created a fun and intriguing space that is inviting and warm. Having taught primary grade students in Sandwich for 15 years Lyons was profoundly affected by the events of Sept. 11, 2001. She decided to leave the classroom and follow her longtime dream of becoming a certified art teacher. In recent years she has taught in numerous after school programs and through many area art groups and institutions. She is especially well known for her ongoing Art Journal Project that has been shared with countless children and families. Long a supporter of social justice and a strong advocate for abused and homeless women and families, Lyons creates many projects that are community based and has raised a lot of funds for programs that help women and families at risk. She is passionate about helping families bond through creativity and as she describes her upcoming holiday programs for families the light from her eyes practically dances right out onto the table between us. If the latest family project of making paper mache sculptures called “Screamers” is any indication of the fun projects going on in this creative space, families are in for some awesome treats and amazing opportunities to create lasting memories together. Lyons was not born here on the Cape and in fact came from New Jersey. She visited the Cape with her family when she was 8 years old and begged her parents to move here. They told her they had a house and jobs. She laughed as she added, “Hey, I told my parents there were houses here, too, but they didn’t budge.” She moved here with an infant in tow 27 years ago and has never looked back. She knew even as a child that this was her true home. Today, her children are grown and she lives in Centerville. Lyons has scheduled Family Holiday Workshops beginning in November that will include ornament making and decorating, creating star books and blank journals, making wreaths and Yule logs, crafting gift bags and tags and creating lanterns. There are also several family acoustic jam days that will include much merriment and music making with Alicia Mathewson as well as a celebratory hat-making day just in time for New Year’s Eve. Lyons has ambitious plans for an expanded class program schedule and is eager to get more families and students of all ages involved. Go to the websites http://www.artsonthecape.org or http://www.exploreartthroughthejournalproject.com for schedules, prices and more information on upcoming programs.